Dink Smallwood was a little indie darling that deserved a lot more attention than it got back when it was first released in 1998. Developed by a three-person team at Robinson Technologies, Dink Smallwood was the antithesis of your typical RPG adventure game. You were not the chosen one, or a knight, or even all that likable. You were just a pig farmer with delusions of grandeur, desperate for fame, fortune, and the women that you thought came with it. 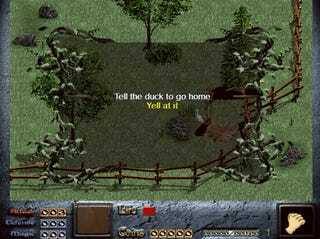 As an isometric action-RPG, Dink Smallwood's gameplay was a solid if unspectacular offering for the time. 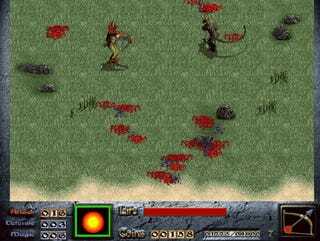 The graphics were clean, the combat required a cat-and-mouse hit-and-move strategy, and the controls were wonderfully tight. But based on gameplay alone, Dink Smallwood would have been an easy game to forget. Where Dink shined was its personality, and that personality has allowed it to endure with a small but passionate community of fans 16 years after its release. As a character, Dink is the worst kind of dude-bro imaginable. He's insecure, narcissistic, and spouts off painful one-liners to every girl he meets. He's not a beloved savior - most of his village tolerates him begrudgingly - and he sure as heck wouldn't be anyone's top pick when the world needed saving. When Dink meets the magical wizard who sets his journey in motion, Dink tries to pet him. Ya, that's the kind of guy we're dealing with here. With the wrong kind of writing, that type of character could be insufferable and grating. But the writers behind Dink Smallwood are excellent, and many of the NPCs exist to play the straight contrast to Dink the jester. You'll roll your eyes at Dink, but it's charming at the same time. And despite his flaws, there is something uncomfortably relatable about Dink. Who hasn't wished they were the knight in shining armor instead of the peasant on the sidelines? "He's much more than a pig farmer," I'd shout while Dink was being teased by the local bar patrons. He might be a self-centered jerk, but he's MY self-centered jerk. On top of the main character, the game is wickedly funny from start to finish. Giant pillbug monster roam the countrysides, enemies explode in clouds of blood when you defeat them, and the dialogue drips with sarcasm. There's a homeowner who freaks out when you enter his house 'just to look around,' and a cult member who gets admonished by her peers for abbreviating the name of the dragon carcass they're worshiping. And there are a lot of ducks, which is all that needs to be said. It's all ridiculous in the best kind of way, funny not just for a game but funny, period. If you've never stumbled upon Dink Smallwood, now is a great opportunity to make up for lost time. You can download the HD version of the game for free on RTSoft's website, or buy the mobile version for $2.99 on the iTunes App Store or Android Market.